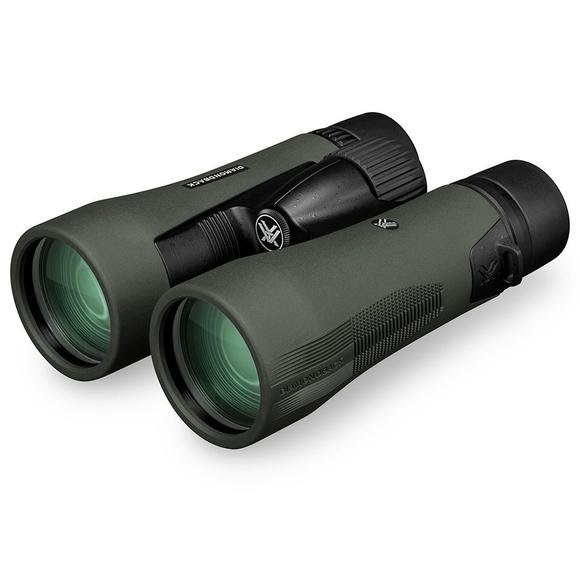 Vortex Diamondback binoculars defy the price vs. performance ratio in the world of optics. An astoundingly efficient and high-performing optical system with enhanced, dielectric, fully multi-coated lenses serves up stunning views and impressive low light performance, critical attributes when working to glass and evaluate game. Increase light transmission with multiple anti-reflective coatings on all air-to-glass surfaces. Multi-layer prism coatings provide bright, clear, color-accurate images. Phase corrected roof prisms enhance resolution and contrast for sharp, bright views. Valued for greater durability and a more compact size. Optics are sealed with o-rings to prevent moisture, dust, and debris from getting inside the binocular. Barrels are filled with argon gas to inhibit internal fogging. Durable rubber armor provides a secure, non-slip grip. Twists up and down for comfortable viewing with or without eyeglasses. Adjusts the focus of both binocular barrels at the same time. Compatible with a tripod adapter, allowing use on a tripod or car window mount.